This time last year, I analyzed the state of the startup acquisition market. Two key trends surfaced. First, the larger acquisitions were becoming larger. Second, that the total number of acquisitions in 2014 would achieve a 5 year high. As of mid-2015, the first trend continues while the second seems to have faltered. The median acquisition price for technology companies in Crunchbase’s data set is plotted above, bucketed by size. For example, the $500M bucket marked in yellow includes all acquisitions between $100M and $500M. 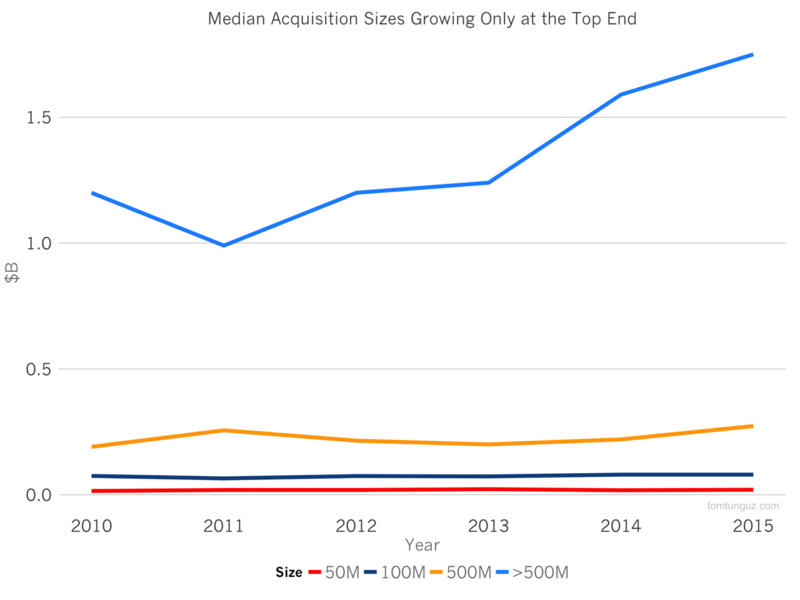 Startups haven’t seen any increase in the median value an acquirer pays over the five year period. However, at the top end of the spectrum, companies sold for $500M or more, has increased 40% over the last five years from $1.25B to $1.75B. Premium startups are fetching higher premiums than in recent history. Many technology incumbents possess substantial cash balances , which enable them to make substantial acquisitions. But M&A velocity has slowed in 2015 compared to 2014 - at least through the first quarter. The chart above plots the quarterly number of acquisitions, again by size. Q3 and Q4 of 2014 saw record high activity over the last five year period. 2015 Q1 activity, meanwhile, has declined. With these changes in the acquisition market, the relative share of acquisitions has evolved, too. 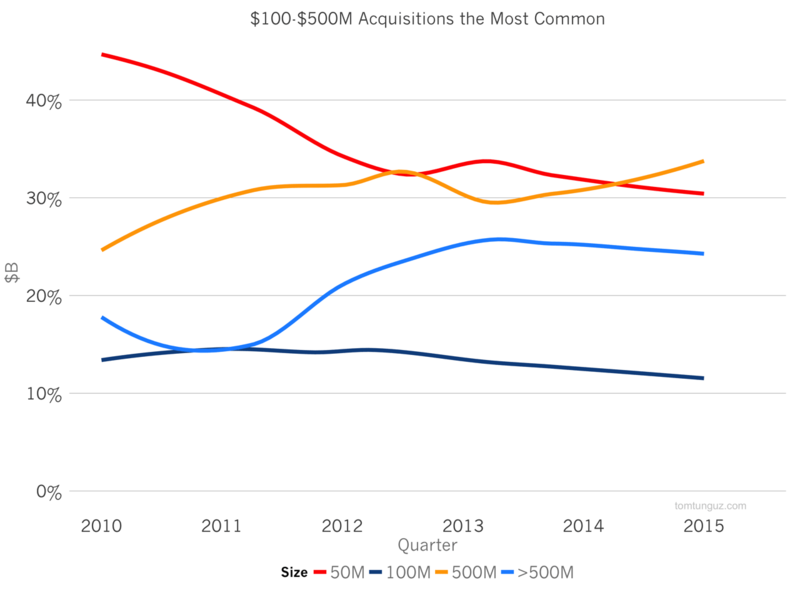 $100-$500M acquisitions are now the most common, displacing the $0-50M. This may be because fewer smaller acquisitions are disclosed, or it may highlight the waning of the acquihire era, a time in Startupland when large incumbents acquired startups at substantial premiums, principally for their talent, rather than technology or revenue. On the whole, 2015 has seen a decline in M&A activity, though premium companies do command higher prices than before. Coincidentally, venture backed startup IPOs have also seen a weak first quarter. It’s hard to say why M&A and IPO activity have seen declines in 2015. I suspect a big contributor may be the availability of venture and growth capital. Why sell the business if it’s easy to raise capital to grow it and make it even more valuable?